My parents had chickens in Tuscon when they were in grad school, and have recounted hilarious tales to me for many years about their chicken adventures. Ronaldo the hen was so tame, my dad took her to several halloween parties as an accessory to his costume. Once they discovered thousands of ticks living in the plywood under the chicken coop and decided to torch the thing. Another time they came home to find their german shepherd plucking the last few feathers out of a chicken- while it was still alive. My parents have not kept chickens since we moved away from Tucson, but they seem to remember those days fondly, and were very supportive when David and I declared we would raise a flock of our own. Discussing the possibility of pets has proven to be a slippery slope for David and I. We thought quite a bit about whether we should move in together near the beginning of our relationship, but as soon as we did- Bam!- we had a dog a week later. What’s a home without a dog? A while later, while walking the dog in the park, David suggested we get a cat. My answer was a definite “No.” But there’s no unplanting the pet seed. When we got home, we got in the car and went to the pound, and brought home the cat that jumped out of her cage onto David’s shoulders. The chickens took us a while longer, perhaps because it was not yet chick season when we first started thinking about them. Both of us oscillated back and forth, wondering if they would tie us down or bother the neighbors. Would the eggs and manure be worth the trouble? Finally the waves of indecision gained momentum, one of us pushing when the other had doubts, and once we started looking at which breeds would make good backyard chickens, there was no going back. 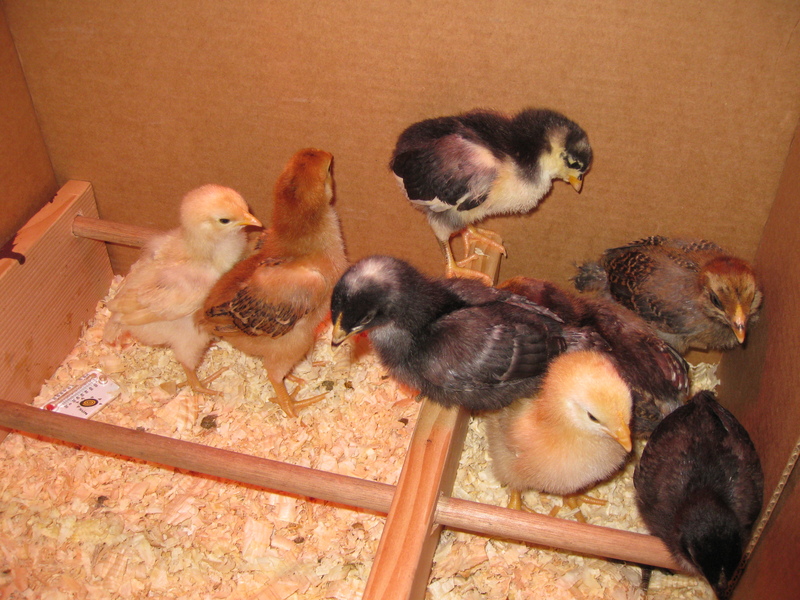 As it turned out, it was also impossible for us to get fewer chickens than the Seattle City ordinance limit of eight. We picked a good mix of excellent layers and interesting breeds from the Portage Bay Grange, and brought them home in a box the size of a loaf of bread. We’ve given away two that turned out to be roosters, and now one of their replacements is becoming rather roosterly too. It’s quite sad giving them away, but the hens are noisy enough as it is. We’d like to be giving the neighbors eggs graciously, not out of obligation. 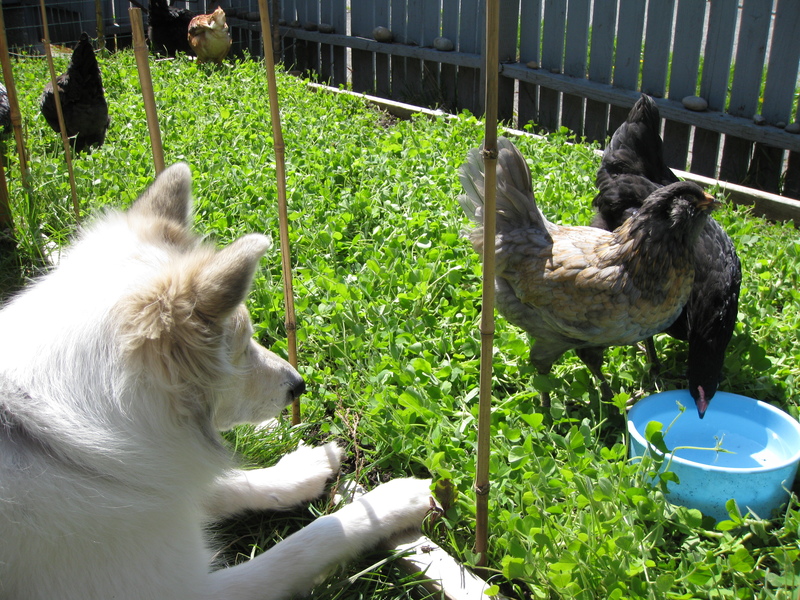 So, as soon as my latest Craig’s list ad is answered by someone who has a nice big yard outside the city – big enough for Alberta’s big, soulful eyes – our flock will be seven.